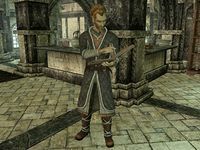 Viarmo, an Altmer bard, is Headmaster of the Bards College in Solitude and as such, oversees the efforts of the three teachers, Inge Six Fingers, Pantea Ateia, and Giraud Gemane. His pride and joy is the Burning of King Olaf, an annual festival held by the College in order to celebrate Solitude. Due to the recent murder of High King Torygg, the mourning widow and current Jarl, Elisif the Fair, has put a stop to the festival. She reasons that burning a king in effigy is in poor taste, and you will have to help out a discouraged Viarmo prove her wrong during the quest Tending the Flames. His room is located in the northeastern wing on the ground floor of the college and he sleeps there every night between 7pm and 6am. He will then find his usual spot in the lobby where he enjoys a one-hour breakfast at 7am. He stays in the lobby until 10am when he heads up to the Winking Skeever for a three-hour lunch with Giraud and Pantea (see notes). At 1pm he is back in the lobby where he spends the entire afternoon. After a one-hour dinner at 6pm he goes straight to bed. This daily routine only triggers upon completion of Tending the Flames; until then, Viarmo will wander around the ground floor of the Bards College 24 hours a day, with a few major exceptions listed below. Viarmo wears a set of fine clothes along with a pair of fine boots. He carries a key to the college and a selection of common items and gold. 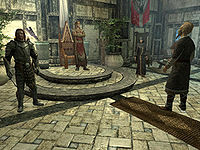 All the bards performing all over Skyrim will point you towards the Bards College, and some of them will even mention the Headmaster: "I think the Bards College might be looking for recruits. You should speak to the head of the college, Viarmo, if you're interested. ", "If you go there, talk to Viarmo. He's the headmaster." and "If you're thinking of applying, talk to Viarmo in Solitude." A statement from local food merchant Jala proves that Viarmo is in high regards: "Everyone who's anyone. Viarmo bought an apple the other day, said he was looking for a new student. ", while one of the students at the college, Jorn, is less impressed: "It's an honor to have Viarmo for instruction on drum, but he's far too reserved for my tastes." and "Viarmo is too concerned with precision. What of instinct? Hmm? What of passion?" When you enter the Bards College, Viarmo will actively seek you out and personally welcome you: "Welcome to the Bards College. I am the headmaster here. How may I help you?" When you apply for membership, he will respond: "Always a pleasure to meet a prospective bard. You should be aware that many apply but we accept very few people. When possible, we ask applicants to perform tasks the college needs completed. In this case, I do have a task befitting an aspiring bard..." He will then move on to your initiation task, covered in this section. However, he will tell you if the civil war has affected the college: "Not much. But as a bard, I find the whole affair depressing. There are no heroes in this war. No winners to be had and no real conclusion." If you have conquered Solitude for the Stormcloaks, he will change this statement: "There are no heroes in this war. Even with Ulfric here in Solitude, there are no winners to be had. No real conclusion." He will, however, continue on a positive note: "If you want something a bard can dig into look to the dragons. A thousand years from now Skyrim will have changed rulers dozens of times but the return of the dragons, that story is once in an era." When asked if he knows anything about the dragons he will point you towards his Dean of History: "Not much, to be honest. Their return was a shock to us all. Giraud Gemane has some tomes about them in the library, if you're interested." Once you have been initiated into the Bards College, Viarmo will also start to greet you differently: "Welcome to Solitude. Home of the arts here in Skyrim. ", "It is my personal mission to ensure that the Bards College preserves the great deeds of the past, in both poetry and song." 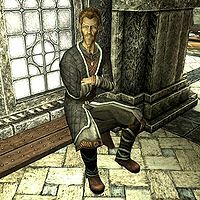 Similar to the Arch-Mage of the College of Winterhold, Savos Aren, Viarmo will not mix his school with politics: "I generally don't involve myself in politics. Good tales deal with the issues of the day, but a wise bard remains a neutral observer." and will elaborate with: "We bards record history - we do not make it. You'd do well to remember that." Lastly, he may greet you with: "Never forget, the most important job of any bard is to entertain. The day you lose your audience is the day you cut your lute strings." "Complacency is the bane of art." Pantea: "Passably. Aia is my star pupil. None of the others can hold a candle to her. Especially not that wretched llldi." Viarmo: "Try not to play favorites, Lady Ateia. It does a disservice to the whole class." Giraud: "Bunch of distractions, if you ask me. They just interrupt the rest of my work." Viarmo: "I'm sorry to break it to you, Giraud, but students are an unfortunate necessity of a college. Do try to persevere." After welcoming you to the College and revealing that all new applicants have to perform an initiation task, Viarmo will readily explain what needs to be done: "Elisif has forbidden the Burning of King Olaf, a Festival put on by the Bards College. We need to change her mind. To convince her I want to read King Olaf's Verse. A part of the Poetic Edda, the living history of Skyrim. Unfortunately the verse was lost long ago." He will then explain your part: "Yes. According to Giraud, our histories keeper, the portion of the Edda dealing with King Olaf might still exist in Dead Man's Respite. I need you to retrieve the poem." The quest will then initiate and you can ask him why Elisif forbade the Festival: "As you may be aware Elisif's husband High King Torygg was recently killed. Elisif mourns her husband deeply and she feels that a festival that burns a King in effigy is... distasteful. I've tried to convince her the festival is many centuries old and celebrates Solitude but I need proof. I believe King Olaf's verse will provide that proof." Lastly, you can ask him what the Poetic Edda is: "I think Giraud here would give you the best explanation of both it and the history of King Olaf's Verse. You should speak to him about it." He will then bid you farewell: "I wish you luck in finding the verse." When asked, Giraud Gemane will be happy: "He's sending you after King Olaf's Verse then? That's good, we shouldn't leave it lying around now that I've figured out where it is. The Verse was Svaknir's contribution to the Poetic Edda, the living history of Skyrim. Each bard adds to the Edda in his or her time." He will then explain that the verse is part of the Poetic Edda, explaining Viarmo's motivations for seeking it out: "The verse criticized the reigning King Olaf. He was so incensed the bard was put to death and all the copies burned. At least, that's what we thought until I translated some ancient texts a year or so ago. We now believe King Olaf buried the truth with the bard. If I'm right Svaknir and King Olaf's Verse lie in Dead Men's Respite, along with the burial chamber of King Olaf himself." "Now let's take a look at this..."
"O, Olaf, our subjugator, the one-eyed betrayer;" "death-dealing demon and dragon-killing King." "Your legend is lies, lurid and false;" "your cunning capture of Numinex, a con for the ages." He will then stop and wonder: "King Olaf was Olaf One-Eye? He famously captured the dragon Numinex and took him to Dragonsreach. What do we say really happened?" Three options are available at this point, all of which will reflect how the poem will turn out. Olaf found him asleep. "Ha! All right, I'm writing that in. I'm not sure about the court but I find that much more probable than Olaf capturing a dragon." Olaf made a deal with Numinex. "Hmmm, Olaf did become king and Numinex escaped later. It's entirely possible... and I'm sure the court will like that, I'm writing it in." Olaf was Numinex. A dragon in human form! (Persuade) "I find that highly unlikely... but the court will love it. I'm writing it in." OR "I find that highly unlikely... I think it would be irresponsible to write that in to the verse." "Olaf grabbed power, by promise and threat;" "From Falkreath to Winterhold, they fell to their knees;" "But Solitude stood strong, Skyrim's truest protectors." "Olaf's vengeance was instant, inspired and wicked." Once again, Viarmo will stop and wonder about the odd verse: "Strange. According to history Solitude attacked Winterhold, but Aesgeir seems to be saying Olaf reacted. What do we say happened?" You will have to provide your input to fill out the rest. Olaf ordered disguised troops to attack Solitude? "And they got the orders backwards. Ha ha ha. Yes, I'm writing that in. It should be good for a laugh from the court." He convinced Solitude to attack Winterhold. "It's not the most exciting answer but the most likely. I'll write it in." He sacked it and used magic to blame Solitude. "That sounds good. I'm not sure the court will believe that Olaf had wizard powers but we shall see." Olaf sacked it in dragon form! (Persuade) "Oh that is exciting! I'm sure the court and the Jarl will love it. I'm writing it in now." OR "No, that's pushing it too far. Very exciting but highly unlikely, I can't possibly write that in." "I wish to present King Olaf's verse from the Poetic Edda." Elisif: "Ah, Viarmo. I assume you are here to petition for the reinstatement of the Burning of King Olaf Festival." Viarmo: "I am, Jarl. I wish to present King Olaf's verse from the Poetic Edda. Recovered this very day from the Bards Tomb." Elisif: "Ah, you mentioned something that would convince us the festival should take place but I didn't expect King Olaf's lost verse. Please proceed." "O, Olaf, our subjugator, the one-eyed betrayer;" "death-dealing demon and dragon-killing King." "Your legend is lies, lurid and false;" "your cunning capture of Numinex, a con for the ages." No shouting match between dragon and man, no fire or fury did this battle entail. (Olaf found Numinex asleep): Olaf captured a fast-sleeping dragon, a mighty feat which the meek would not fail. (Olaf made a deal with Numinex): Olaf struck a deal to make himself king, Numinex let go though none tell that tale. (Olaf was Numinex. A dragon in human form! ): Olaf was Numinex in human form, on moonless nights he would spread wings and sail. Olaf grabbed power, by promise and threat; From Falkreath to Winterhold, they fell to their knees; But Solitude stood strong, Skyrim's truest protectors. Olaf's vengeance was instant, inspired and wicked. Olaf gave orders, Winterhold disguises. An attack on Solitude total destruction to follow. 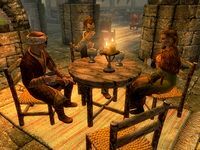 (Olaf sacked Winterhold and used magic to blame Solitude): Because Solitude would not soon bend knee, Olaf would hurt them while his status accrued. 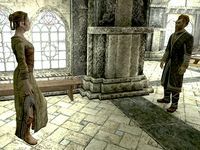 He sacked Winterhold his only true ally, and used magic bold to blame Solitude. (Olaf sacked it in dragon form! ): Because Solitude would not soon bend knee, Olaf would hurt them while his status accrued. He sacked Winterhold in dragonform, and bent their minds to blame Solitude. (Any other suggestion): His men dressed up and then went out to fight, but they reversed Olaf's orders much to Winterhold's sorrow. So ends the story of Olaf the liar, a thief and a scoundrel we of Solitude commit to the fire. In Solitude bards train for their service, they also gather each year and burn a King who deserves it. "You have proven your point, Viarmo." Elisif: "You have proven your point, Viarmo. The festival is truly a celebration of Solitude and a condemnation of false kings." Viarmo: "I thank you and the college thanks you, Jarl." Elisif: "Furthermore, I believe that such a fine poem deserves some payment of Patronage. The college will be moderately/generously rewarded." Viarmo: "Thank you yet again. I will make sure our applicant, who was instrumental in... recovering the poem will be well rewarded." While the court returns to their daily routine, Viarmo will turn to you: "Unbelievable! You have done us a great service here. I can't begin to thank you enough." When asked if the effort has made you a bard, he will say: "Soon, soon. These things must be done properly, you will be inducted as part of the Festival itself. I need you to go speak to Jorn. He was preparing the Effigy of King Olaf. Tell him to finish the preparations, the Festival is back on." He will then return to the college and will only say: We should have the festival soon. He will also exit conversation with a reminder: "Don't forget to speak to Jorn when you're ready for the festival." When you speak to Jorn, he will say: "Ah the bard-to-be. Did Viarmo send you?" and will then tell you to join the Burning of King Olaf outside the college. Once outside, you will find half the city gathered around the effigy of King Olaf, including Viarmo with a lit torch in his hand. When everything is ready he will provide a speech: "Welcome, people of Solitude! We of the Bards College are pleased to be here to celebrate the Burning of King Olaf. The festival would not have been possible without the dedication and hard work of our latest applicant." You will now receive a round of applause from the citizens, while Viarmo continues: "With the lighting of the effigy..." Viarmo will take a brief break and use the torch to set the effigy on fire and will then continue: "He becomes a full-fledged member of the Bards College. Please welcome our newest Bard!" There is another round of applause while King Olaf burns. Viarmo will then walk up to you: "I think they like you." He will then confirm that you are officially a bard at the prestigious college: "Yes. Congratulations, you are now a full-fledged member of the Bards College. Due to your adventurous nature several of the college professors have some things they wish you to do. What's more, Elisif has declared the Burning of King Olaf should become a weekly event. And finally, there's the matter of the Patronage that Elisif wanted me to give you." He will then hand you a reward and start his daily routine by going directly to bed while half of Solitude celebrates the Burning of King Olaf. Pantea "Viarmo, the college really must take a stand on the war!" "Viarmo, don't you think it's time that the Bards College officially declared support for the empire?" Viarmo "Lady Ateia, it is the official position of the college to remain neutral in all political affairs. We cannot risk our history by choosing sides." "Now, now, our duty is to record the great tales of history, not to pick sides in them. Best to stay out of the warfare, I feel." Aia "But I'm sure those Skyrim dogs would stand down if the keepers of the tales showed their patriotism!" "Maybe if we stopped singing about their silly Nord heroes, the rebels would stop making such a fuss!" Pantea "Aia, please be quiet. Viarmo and I are discussing matters of national politics." "Aia, this is a delicate matter. Why don't you review your lessons and be silent for a while." Viarmo "Pantea, perhaps you should attend to your students, and leave the politics to me." "That is precisely why we remain neutral. Ours is to tell tales of empires, not to make or break them." After the related quest, Viarmo may hold the burning torch from the festival permanently, even when he is sleeping in bed. To fix this, open the console and select Viarmo. Then, type removeitem 0001d4ec 1, followed by equipitem 0001d4ec, and finally removeitem 0001d4ec 1. Attack Viarmo until he kneels down on the floor; he won't die as he is essential. Once he does that, he shouldn't be holding the torch any longer. A bounty will be earned if you use this method. Another method is by reverse-pickpocketing another torch into his inventory. This fixes the issue with minimal bloodshed. From then on, he will only equip the torch when appropriate. Due to two different bugs in Tending the Flames, the recitation may not match your choices, and some of the recitation can never be heard at all. 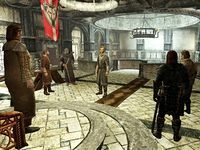 This issue has been addressed by version 1.0 of the Unofficial Skyrim Patch; one of the bugs is fixed, however the other is outstanding—see the quest page for more details.